Does an ear infection and hearing loss go hand in hand? 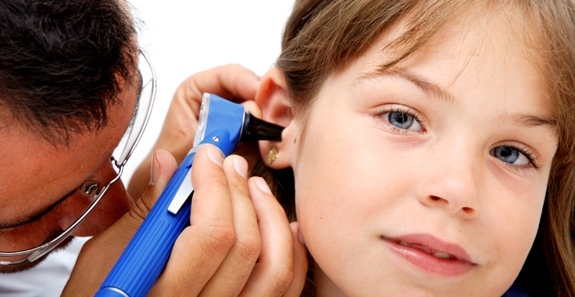 Ear infections are a common medical condition in children and some adults. A question that gets asked quite frequently by our patients is; can an ear infection cause hearing loss? This question is especially common with patients who have young children or grandchildren, as ear infections are most common in children. Ear infections occur behind the ear drum in the middle ear space and cause a conductive hearing loss. Conductive hearing loss occurs when sound is not able to be carried from the ear to the brain due to something blocking the path. In the case of an ear infection, it is the fluid buildup in the middle ear that causes the hearing loss. Getting Technical with Ear Infection and Hearing Loss: How Exactly Sound is blocked when an ear infection causes fluid buildup? 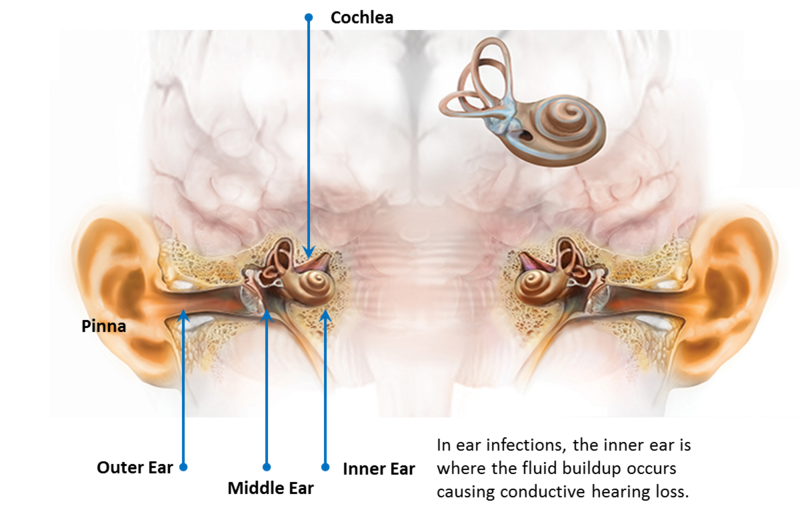 Sound is collected by the pinna and travels down the ear canal to the ear drum. The ear drum vibrates in response, which sets the middle ear bones (malleus, incus, and stapes) into motion. The stapes press against a window in the cochlea which causes stimulation of hair cells sending a signal up the auditory nerve and into the brain to process the sound. When fluid or infection is present in the middle ear, sound cannot appropriately travel through the system causing the conductive hearing loss. A conductive hearing loss means the inner ear (cochlea and nerve of hearing) are functioning normally and the hearing loss is a result of the infection sitting in the middle ear space. Hearing back to normal: Once the fluid and infection are cleared out, hearing will more than likely return to normal. Important to Remember: If ear infections go untreated, more serious medical conditions can occur such as mastoiditis (infection in the bone surrounding the ear) or an ear drum perforation. If you are concerned that you have an ear infection, it is best to seek medical advice from a physician.